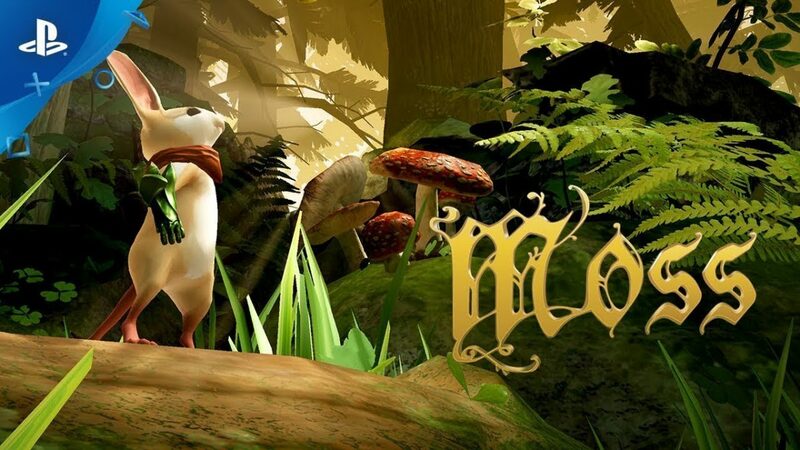 Moss is among the first flagship PSVR titles to truly embrace the concept of the player as an observer and the camera for the character. With an adorable and capable main character in the form of Quill, does this sprawling adventure make VR a must-have, or does this mouse miss the cheese? Moss has an excellent framework for its storytelling. A wonderful narrator with a soft and soothing voice speaks as you flip the pages of an ornate book resting upon a pedestal in front of you. When you’re not in the game’s world, you find yourself sitting alone in a massive cathedral with stained glass windows and impressive architecture. The narrator is your sole source of story. Her standard reading voice is pitch-perfect, but she also changes her voice slightly to speak as different characters, including Quill herself. It feels like a fairytale story in the best way possible. Regardless of your age, the game’s storytelling will make you feel like a kid again as you flip through the pages of the book in front of you. Once you’re in the game’s world, the story explains your role as both a guardian and an observer. As a result, you not only watch Quill navigate the game’s environments, but she is aware of you as well. She doesn’t speak directly, but she’ll give you a thumbs up when you beat a puzzle, or pantomime hints if you’re stuck. She even uses simple words and phrases in American Sign Language to communicate with you, all of which makes her feel like a real character and a fun companion to have on your journey. It all combines to create a charming, fun, and believable world that you’ll want to explore as thoroughly as possible. While the storyline falls into some fairytale tropes, the setting and backstory help to make it feel like a unique tale that stands on its own. While a standard third-person game like this one would have a fixed camera or something behind the main character, Moss is unique in that it leverages VR to make you the camera. Your perspective rests above the ground, looking down on Quill as she navigates. You control her directly with the DualShock 4, but as you’re moving her you can duck, look around corners, or even stand up to see things outside the normal range of view. Not only does this let you explore the nooks and crannies of the intricately designed environments, but you can also spot collectibles in this manner. Controlling Quill feels responsive, and mechanics that involve moving the DualShock 4 are all perfectly functional with solid tracking. I enjoyed the mix of combat and puzzles, but I will say that the combat spiked in difficulty later in the adventure. I would have preferred a stronger focus on the puzzles over combat as I think they were more interesting and engaging than the hack-and-slash combat encounters. In some instances it just felt like the game was sending endless waves at me until I could move on. Moss is at its best when it lets you explore the world and take in the sights. While the combat works fine, it was the puzzles and the navigation that I really enjoyed. Playing Moss in PlayStation VR on PS4 Pro is a truly mesmerizing experience. The rich and colorful environments have an incredible sense of scale and an intricate attention to detail. Everything looks crisp and animations on Quill are positively pristine. Moss is easily one of the best looking games on PlayStation VR and a strong adventure in its own right. It pushes the boundaries of what we expect from a VR title, and for that reason alone it’s absolutely worth your time and hard-earned cash. Give it ten minutes, and Quill will make you fall in love.